Benji learns how to manipulate memories himself, but having that power comes at a cost to his family, and possibly to his own mind as well. Genevieve's powers get out of control as she steals more and more memories from people in town including Benji s sister, Kelly. Benji must learn to use this newfound power, as he is the only one able to stop Genevieve. Don't let the genre of this book fool you! This middle-grade novel packs so much punch that you WILL NOT be able to put it down. In fact, that is a challenge! If you give this book a read, I challenge you to not devour it in one sitting, because I am almost certain you will! 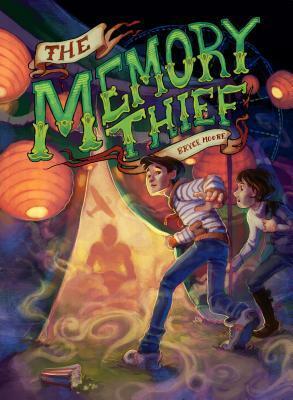 The Memory Thief is a compelling story about a young boy's good intention to help his family, but ends up getting so much more than he bargained for! In this face-paced novel you will be taken down a magical and mildly creepy adventure along with Benji and Kelly. I couldn't help but get a Tim Burton-esque feel while reading The Memory Thief. I can definitely see fans of J.K. Rowling and Tim Burton gobbling up this tale. Bryce Moore did a spectacular job at weaving together the intricate pieces of this story. And kudos to such an original story line; that is one of the main reasons that had me loving this novel so much. It wasn't quite like anything I've ever read before. If you're looking for a great book to help get the kids into a spirit of Halloween OR looking for a great story for yourself, The Memory Thief is the perfect book to curl up with!